Mesh: Use 156-186 thread per inch (62-73 threads per cm) mesh. Opacity: Discharge inks are virtually transparent until activated with proper cure times and temperatures. Stencils: Use any direct emulsion which is listed as water base / discharge resistant on all screens within job. Check with emulsion manufacturer for specifications and proper usage. Additives: DSPP-9ZFS must be added at specified amounts for the effect to take place. ATEX-9600 Aqueous Stay Open may be added at .5-1% by weight to slow down ink drying into mesh. 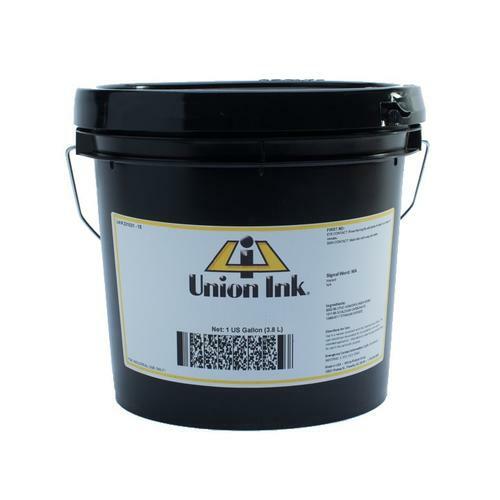 Small amounts of water may be added to increase inks penetration into fabric. Mixing Instructions for DSPP-9ZFS Discharge Agent: The discharge system consists of two parts: the ink and the Discharge Agent. The DSPP-9ZFS Discharge Agent is supplied as a powder and sold separately. Add 6-8% DSPP-9ZFS Discharge Agent of the total weight to the Soft Hand Clear, Soft-Hand White or the custom colour created utilizing the DSPP-9070 Discharge Base and Union's PIGT-Series Pigments). Mix until totally dissolved. Minimize waste by only mixing enough of the ink / discharge agent that will be used in a 6-8 hour period. Printing Instructions: Print the Soft-Hand Discharge inks first, forcing the ink well into the fabric with moderate squeegee pressure, Open mesh / graphic should be flooded immediately after printing to avoid ink drying into screen. If utilizing DSPP-9050 Soft-Hand Clear other plastisol or water based colours may be printed without flash curing. The colour values of the over-printed inks will appear after curing. You may mist the screen occasionally with water to maintain the ink viscosity during long printing runs. Print custom dischargeable in the same manner. Wash-Up: Clean the screens and squeegees with warm water and if necessary, mild detergent to remove dried ink from mesh. Printing Instructions: Print the Soft-Hand Discharge inks first, forcing the ink well into the fabric with moderate squeegee pressure, Open mesh / graphic should be flooded immediately after printing to avoid ink drying into screen. If utilizing DSPP-9050 Soft-Hand Clear other plastisol or water based colours may be printed without fl ash curing. The colour values of the over-printed inks will appear after curing. You may mist the screen occasionally with water to maintain the ink viscosity during long printing runs. Print custom dischargeable in the same manner. Curing Instructions: Cure for a minimum of 90 seconds at 320º F (160º C) to activate the discharge reaction and produce a washable print. Evaporating the water too quickly will stop the discharge reaction and result in dull colours. Wash-Up: Clean the screens and squeegees with warm water and if necessary, mild detergent to remove dried ink from mesh. be stored longer than 6-8 hours.